Blackheads are a menace and a sure fire way to frustrate efforts to achieve beautiful, clear skin. Blackheads can appear on your face, back, legs, and nearly anywhere else on your body, and can be caused by a number of things such as skin care regimes, age, heredity and hormonal status. Open comedones, as they’re formally known, look like large pores filled with visible black debris. Squeezing them is a big no-no as it can leave your skin inflamed and scarred. So, here are a few methods for preventing and getting rid of blackheads so you can achieve that flawless skin you deserve. Prevention is better than a cure and maintaining a healthy lifestyle will keep away those annoying blackheads. Get enough rest and avoid eating too much fatty meats, cheese, peanuts, chocolate, shellfish and cream powder. Likely to appear more in younger people than older people, it is important to avoid stress and get enough sleep. 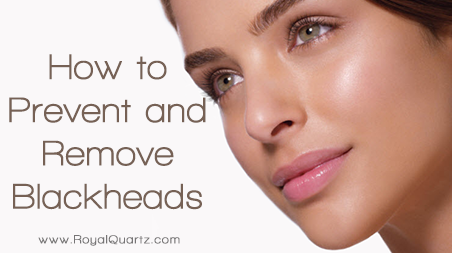 Cleansing, exfoliating, and moisturizing are key when aiming to rid yourself of blackheads. Just remember that patience and consistency are the keys to elimination. Mix baking soda with water or apple cider vinegar to create a gentle scrubbing paste. This gets rid of dead skin clogging up pores. Honey is very effective in the treatment process, and all you need to do is warm and apply on the face of the blackheads. Wash the area after 10 minutes and it also leaves the skin moisturized as well. One thing to avoid is excessive oil and creamy cosmetics. By moistening your skin every night for 15 minutes with a warm wet cloth, dead skin cells and dirt will be lifted off and give you clear skin after some time. Visiting your dermatologist will also get rid of blackheads through a medical procedure known as microdermabrasion. You will get comedone extractions and chemical peel treatments that will improve your skin texture and give you clear skin. What method of blackhead elimination have worked for you?